Suzanne Desan. 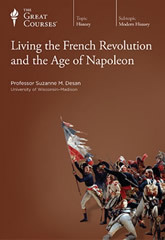 Video and Audio Course: Living the French Revolution and the Age of Napoleon. The Great Courses, 2013. In one of the most pivotal and exciting eras of European history, the French Revolution and Napoleonic Empire stunned the world and wrenched Europe toward modernity. The Revolution overthrew the monarchy to create a republic, leveled the aristocracy, replaced Catholicism with goddesses of liberty, set up Sister Republics in Europe, and sparked slave revolt in the French Caribbean. This radical experiment in democracy also unleashed the Terror and launched Napoleon Bonaparte, the brilliant politician and general who built an astonishing European Empire. Tracing events from the Old Regime court at Versailles to Napoleon’s fall at Waterloo, this course weaves together political and social analysis with personal stories: Marie-Antoinette, Robespierre, and Napoleon rub shoulders with workers storming the Bastille, women rioting for bread, and soldiers crossing Russia. The lectures also address big questions: Why did the ideals of “liberty and equality” become mired in Terror? How did the Revolution and Napoleonic Empire lay the foundations of modern politics, lead to the restructuring of Europe, and create repercussions from Haiti to India?